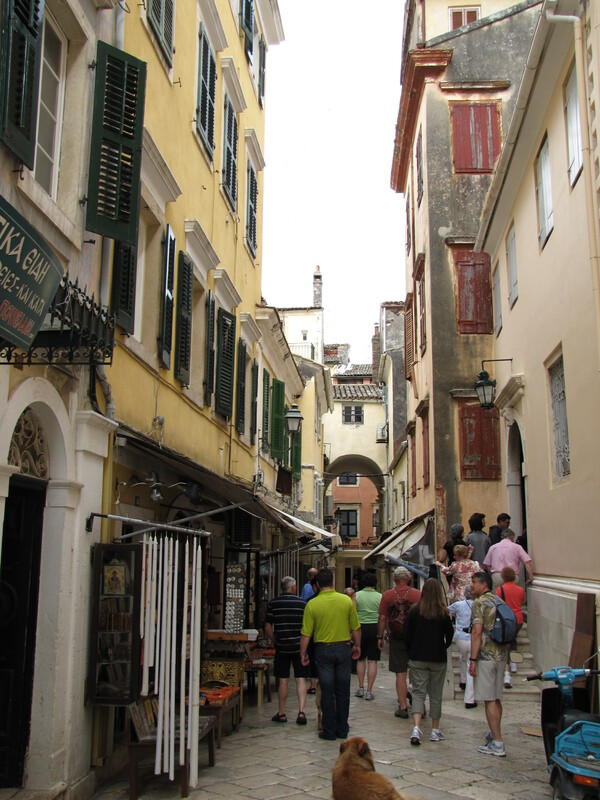 We were sitting on a tour bus on the island of Corfu experiencing one of my pet peeves of travel: the tourist who makes the entire group wait for them. Our guide had given us a thirty minute break on the sandy bay that sits below the 13th Century Theotokos Monastery. She also gave us clear instructions on when to be back at the bus. Ten minutes after the appointed time, we were still waiting for the minor class miscreants. An entire bus of thirty people was waiting for two people when we could have been enjoying our limited time on the island. When we lived in Europe and used group tours more, I saw several interesting preventive measures to this rude behavior. One guide on a multi-stop tour would make people who were late at one stop, sit on the bus for the same number of minutes they were late for the next stop. Punishment on a par with the kindergartner sitting in the corner, but justice was swift and repeat offenses were infrequent. More often nothing was done. Correcting errant tourists is not in the best interests of the guide. Tips and recommendations from people who are chastised are meager, even when the discipline is deserved. On our cruise it wasn’t limited just to buses. In most ports a roll call of missing passengers (and in one case, crew members) would start at the appointed time to cast off. The entire ship of 4000 people waited. Only in the port city of Olympia, Greece did the ship leave anyone behind. Fortunately for that couple they were able to take an expensive four hour taxi ride to our next stop in Athens where they met up with our vessel the next morning. Although I did think it was interesting that when we got the official copy of the ship’s itinerary at the end of the cruise they reported in that port that we departed “with all passengers and crew on board.” Cover up or sloppy record keeping? We learned the secret of how to handle being stuck waiting for fellow tourists: avoidance. Only rarely do we join group tours. More often we’ll read up on places we’ll be visiting or even watch videos. In some cases we hire a private guide. This can be cheaper than the group tours and you get a flexible and personalized itinerary. An even cheaper option for many high traffic locations is on-site audio tours for rent. With a little confidence you can handle the public transportation or negotiate a reasonable price for a taxi ride to your destination. It gets you out of the traveling bubble of a large tour, lets you experience the culture more closely, and avoid the aggravation of waiting for fellow tourists. In the case of Corfu our errant travelers were found twenty minutes after the appointed time. They had walked past our bus, up the beach, and were finally located by another tour guide. Fortunately for them it was a small village with friendly residents. In one other city where we stopped, tourists were treated more like prey, than guests.How about you? What are your travel pet peeves? Have you seen interesting ways of keeping people on time for tours, or like me, do you just avoid it by going your own way? When I was in Ireland, the people were absolutely amazing! Friendly, loved the tourists, loved sharing their stories, helpful hints, etc. Talked with people in their yards, restaurants, they were wonderful. However, sadly, when I traveled to Israel years ago, the shop keepers were the only friendly faces besides other “pilgrims.” Perhaps because I was with a tour group and it was difficult to break away and mingle. Rick Steves has some great, free, audio tours, which we used around Italy. We loved darting around the slow tout groups for our own paced way to see sites! Amy…Good suggestion. We watched Rick Steves videos that covered a number of our stops on this trip. I wish he had more audio tours to cover cities we visited.